What does it imply? The supply of the world's most essential energy source is going off a cliff. Not in the distant future,but in a year and a half. 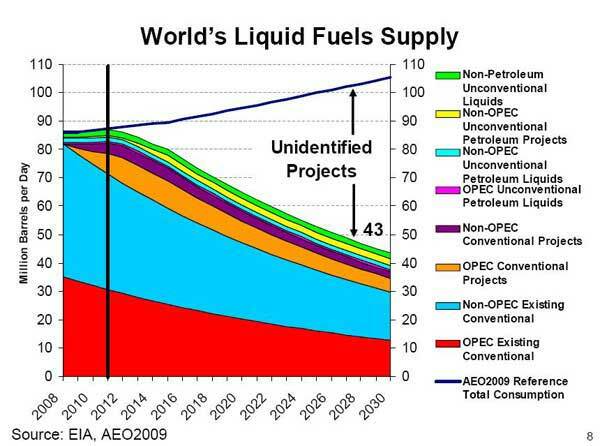 Production of all liquid fuels, including oil, will drop within 20 years to half what it is today. And the difference needs to be made up with "unidentified projects," which one of the world's leading petroleum geologists says is just a "euphemism for rank shortage," and the world's foremost oil industry banker says is "faith based." 1`. Conventional oil will be almost all gone in 20 years, and there is nothing known to replace it. 2.. Production of petroleum from existing conventional sources has been dropping at a rate slightly over 4% per year for at least a year and will continue to do so for the indefinite future. 3. The graph implies that we are past the peak of production and that there are750 billion barrels of conventional oil left (the areas under the "conventionals" portion of the graph, extrapolated to the right as an exponentional). Assuming that the remaining reserves were 900 billion or more at the halfway point, then we are at least 150 billion barrels, or 5 years, past the midpoint. 4. Total petroleum production from all presently known sources, conventional and unconventional, will remain "flat" at approximately 83 mbpd for the next two years and then will proceed to drop for the foreseeable future, at first slowly but by 4% per year after 2015. 5. The production from presently existing conventional sources will plummet from its present 81 mbpd to 30 mbpd by 2030, a 63% drop in a 20-year period. 6. Meeting demand requires discovering, developing, and bringing to full production 60mbpd (105-45) of "unidentified projects" in the 18-year period of 2012-2030 and approximately 25 mbpd of such projects by 2020, on the basis of a very conservative estimate of only 1% annual growth in demand. The independent Oxford Institute of Energy Studies has estimated a possibe development of 6.5mbpd of such projects, including the Canadian tar sands, implying a deficit of 18-19 mbpd as compared to demand, and an approximate 14 mbpd drop in total liquid fuels production relative to 2012, a 16% drop in 8 years. 7. The curve is virtually identical to one produced by geologists Colin Campbell and Jean Laherrere and published in "The End of Cheap Oil," in Scientific American, March, 1998, twelve years ago. They projected that production of petroleum from conventional sources would drop from 74 mbpd in 2003 (as compared to 84 mbpd in 2008 in the DOE graph) and drop to 39 mbpd by 2030 (as compared to 39 mbpd by 2030 in the DOE graph! ).http://www.jala.com/energy1.php.Campbell and Laherrere predicted a 2003 "peak," and the above graph implies a 'peak" (not necessarily the actual peak, but the midpointr of production of 2005 or before. > zero time to plan for the survival of the billions of new people expected by 2050 in the aftermath of ":peak everything." > zero capital, because of failing banks ansd public and private debt, to address these issues. Because if we at any time use more oil than allowed by the graph, we will have even less later..
Because we are already committed to supporting 2.5 billion more people on what we have. Because every day we continue upward in our oil consmption, even though we continue to have more people who need it and billions who deserve to rise from abject poverty, we are making the future supply shortage worse. If you believe the graph, demand will outstrip supply starting at the end of 2011, and severely outstrip supply in five years. What are we going to do, and how are we going to do it? We have no time to decide. It is very unlikely that things can be better than the graph indicates. Why? A closer look at the graph reveals that it was drawn on the assumption that the world's existing conventional fields contain only 750,000 barrels at this time, enough to keep us going only 25 years. The graph assumes a decline rate of 4% per year. As long as the estimates of remaining reserves are right, that can't be far off. In fact, 4% is a relatively low decline rate compared to what has been observed in oil fields generally. Hold on, it's going to be a fast ride down! The "Hubbert Peak" theory of oil field depreciation, which predicted the peak and subsequent demise of the US oil inudtry 15 years in advance and within 2 years of its occurence http://www.hubbertpeak.com/hubbert/1956/1956.pdf, says that with normal production methods, a country reaches peak production in its oil fields when they are 50% depleted, with the production curve being bell-shaped. The peak can be postponed with innovative extraction techniques, but this only causes subsequent more rapid decline of the deposits and total extraction if anything decreasing. The world reached the midpoint of its reserves in the last decade, so the 2005 "peak" implied by the above graph is very close to what would be expected. Astonishingly, Dr. Hubbert in the same 1956 paper predicted, based upon records of only 90 billion barrels of oil having been recovered worldwide, that the peak of world petroleum production would be approximately the year 2000; this apparently quite accurate prediction by Hubbert has largely been forgotten. http://www.hubbertpeak.com/hubbert/1956/1956.pdf . One is tempted to ask why, if one man could predict the timing of the peak 44 years before it occurred, the United States Department of Energy is incapable of recognizing it after it occurred. "Discovery reached a peak in the 1960s - despite all the technology we hear so much about, and a worldwide search for the best prospects. It should surprise no one that the corresponding peak of production is now upon us." Indeed, Campbell's second point means that the inevitable peaking of oil production in the early 21st century, should have been clear for all to see since the peaking of discovery in the late sixties. Campbell does not stand alone. As the US Joint Forces Command observes, "The discovery rate for new oil and gas fields over the last two decades (with the possible exception of Brazil) provides little reason for optimism that future efforts will find major new fields." "Joint Operating Environment 2010," at 31. IF IT'S A "DONE DEAL," WHY DID IT TAKE UNTIL THE LAST MINUTE TO GET HERE? "We can wish it, we can dream it, but it will never be, oil is not renewable, and therefore in time it must be realized that THERE WILL BE NO OIL." ENO Petroleum Corporation, "Peak Oil - The Global Oil Crisis," http://www.enopetroleum.com/opecoilreservers.html. It is hard to conceive of an act or omission causing more pain to more people and creatures than the failure of "those in charge" to announce with reasonable forewarning that the oil supply was going to crash. But it is upon us with no forewarning to the general public at all. The government planning agencies charged with helping the public survive the end of oil could not have performed worse than by recognizing peak oil only after it has happened. Like anthropogenic global warming ("AGW"), "peak oil" has been the subject of decades of denial. Notwithstanding Hubbert's famous coup in pinpointing the peak of US oil production through the simple observation that production naturally peaks when the supply is half gone, few would listen that because the worldwide supply of conventional oil would reach the halfway point in the first decade of this century, trouble was right around the corner. The fact is, coming to that point meant we were in trouble regardless, because the early stages of development of an oil field (like the early stages of growth of virtually anything else) follow an exponential growth curve, and the world's growth addicts love exponential curves, but once you get beyond the halfway point, it is a mathematical certainty that the longer you attempt to conform the field to a pattern of exponential growth, the more the end is going to be precipitous. If you don't decelerate rapidly, that is preciely what has to happen - the decline after the halfway point can only be more rapid than the rise beforehand. What Hubbert observed with respect to the US oil reserves has an intuitive sense to it - as the amount of oil in the field drops, its pressure drops, so the flow begins to slow down - the gusher goes down to a trickle. But if the owner of the field doesn't make full disclosure of what's there, outsiders can only make educated guesses from general geological principles and what the owner is selling, as to what the future holds. And as we all know, full disclosure is not the name of the game in the oil business. If the field is just allowed to release its liquid gold at its natural rate, that's not too bad, because observations like the Hubbert Peak can be applied. But as technology improves and well pressure can be jacked up to compensate for declining reserves, (for instance by pumping water into the wells) the outside observer loses certainty..There remains information about the company's reserves, but the accuracy of that information is seriously open to question. Within OPEC, which allows its members to market in accordance with the amount of their reserves. Hart, "Introduction to Peak Oil," www.philhart.com/content/introduction-peak-oil, there are great temptations to fudge. Outside observers can follow a country's reports on its reserves, but those reports are highly suspect. They will remain constant for years while the country is pumping great amounts of oil without reporting any new discoveries, and indeed they can take sudden leaps upward also without reports of new discoveries. Such "records" lead to the inevitable conclusion that many OPEC reserves reports are fictional. If you would like to see charts of OPEC oil reserves mysteriously contorting themselves, you are invited to take a look at Hart's essay. So if you thought the experts had it all in hand and would reliably warn us when trouble was a'brewin', think again. Not only do OPEC members have internal business reasons to exaggerate their reserves, but companies on the public stock market want to satisfy their stockholders of their long-term viability, and all oil producers want to make their customers confident that they can rely on oil for the long haul. By concealing their future from homeowners, oil companies have made trillions for the real estate business and the banks at the expense of those who chose urban sprawl over dense "near-in" housing, and the companies themselves will make trillions in the near future selling to consumers trapped into oil addiction, who might have sought alterntives more vigorously had they known how close the crash was. Matt Simmons, the banker who has spent his post-Harvard-Business School career advising oil companies and seving as peak oil advisor to the last Presidential administration and specifically to President Bush, ought to know. And what he says is that Western oil companies like ExxonMobil would be strongly opposed to the idea of transparent data because it would reveal “how crappy and old their fields really are.” Energy TechStocks.com, "Meeting the Challenge Matt Simmons: Force All Oil Producers to Give Transparent Data," According to EnergyStocks.com, Simmons has warned that "the failure of Saudi Arabia and other major oil producers to provide transparent production data has left the world in a lurch, unable to know whether it can maintain an adequate supply of oil in the face of burgeoning demand Such uncertainty has led to indecision about whether the world should invest the huge sums of money necessary to develop alternative transportation fuel sources." Now we are facing the consequences of the major oil producers "leaving the world in a lurch": almost complete inability to cope with the severe difficulties we face in transporting, feeding, housing, and keeping warm the burgeoning billions of our numbers. It is hard to conceive of how any private entity could impose so much pain on so many. It didn't need to be that way. The US Government and its cohorts around the world could have imposed transparency on the oil companies as to their true reserves, and we would have had fair warning and the possibiity of coping. Yes, and the moon could be made of green cheese. Of course, as noted, it is possible to produce a graph roughly like the one above with nothing more than production data and reserves data. The former are public, and the latter are known to a limited extent. It has been the consensus of decisionmakers for many years that the world had a total (both produced and still in the ground) of approximately 2 trillion barrels of conventional oil, and as pointed out by Campbell, four decades of dwindling discoveries have left us with an absolute inability to increase available reserves in a timely manner to mitigate the looming shortfall. The two trillion barrel figure was absolutely critical for doing what planning could be done, but at the beginning of the last decade, the US broke ranks with the consensus of the rest of the world, declared through the historically-reliable US Geological Survey (USGS) that world reserves of conventional oil (both consumed and yet-to-be-consumed) were in fact in the neighborhood of three trillion barrels rather than two, a claim which if true immediately provided the world by sleight of hand with an extra thirty years' supply at present consumption rates. To be sure, USGS former employees disputed its estimates as relying "heavily on guesses to calculate new oil discoveries," and on doubling the usual 30 percent recovery rate from reserves "with no technology in mind capable of doing that." Gordon, "Worries Swelling Over Oil Shortage," Energy Bulletin March 20-, 2005. The concerns about overestimation of discoveries proved correct: they continued on their downward track. This alone created a discrepancy between the USGS projections and reality of approximately 900 billion barrels. At the same time, the production data appeared to peak in 2005, prominent Princeton University petroleum geologist Kenneth Deffeyes predicted that 2005 was the year, and Simmons suggested similar concerns. http://www.energybulletin.net/node/4835 and http://www.simmonsco-intl.com/files/Northern%20Trust%20Bank.pdf (p. 31). Nonetheless, based upon the USGS wishful thinking, during the Bush Administration, the Department of Energy was forecasting a "production peak somewhere between 2021 and the start of the next century, with 2037 the most likely date." http://www.energybulletin.net/node/4835 Not to worry. With the peak imminent in reality, like the global warming "scientific skeptics," industry in 2006 came up with a "theory" published in a non-peer-reviewed report, that "peak oil" was in its totality a false concept, and that the true behavior of an oil field or conglomeration thereof was a peak followed by an "undulating plateau" and then a gentle decline by around 2% per year, years, perhaps decades later. According to Cambridge Energy Research Associates (CERA), "“It is likely that the situation will unfold in slow motion and that there are a number of decades to prepare for the start of the undulating plateau. This means that there is time to consider the best way to develop viable energy alternatives that would eventually provide the bulk of our transport energy needs." www.cera.com/aspx/cda/public1/about/about.aspx Not to worry. At the same time all of this was happening, the UN, the US Congress, the Obama Administration and the oil industry were negotiating over goals for global warming legislation. Miraculously, although arguably coincidentally, the percentage-reduction goals agreed to fit quite precisely the percentage reductions in oil consumption that will be physiclly forced upon us all if you believe the above graph: an 18% drop from 2005 by 2020, and an 85% drop from 2005 by 2050. (It is possible to extrapolate the graph, which assumes exponentially dropping levels of existing reserves at a 4% per year rate.) This compares to reductions of CO2 emissions 17% from 2005 in 2020 and 80% from 2005 in 2050 in the bill. So it would appear that the legislative goals have been set, for whatever reason, so that the oil industry will have to do little if anything it won't have to do in any event because of dwindling reserves. http://ecoglobe.ch/energy/e/peak9423.htm . It is hard to see how the negotiators could have come up with such correspondence if they had not all been aware of the impending crash of production and the expected decline rate.. Coincidence? Maybe, but somehow it seems unlikely. Whether or not by intent, the goals fit the needs of the oil companies rather than the needs calculated by the scientists. In short, with all the evidence available, it is hard to see how the industry and the Department of Energy could have failed to see this coming. Their failure to warn the public, given the consequences, verges on the criminal. And if somehow they can claim innocence, then we still have to ask why they did not heed the warning of Matt Simmons, advisor on peak oil to the Bush administration, as to the importance of transparency. But they did not, and here we are. We are on our own. We are rapidly going to have to deal with less and less oil, since there has been no forewarning and no planning. It is a time for communities to prepare for community energy independence, because only that way will be safe. This means relying on the sun and wind and water that have always been with us. It means cooperation with each other to get through seriously difficult times. It means finding altenatives to oil throughout our lives as quickly as possible - the oil that runs our cars, the oil that heats our houses, the oil that runs generators for our electricity, the oil from which chemical fertilizers and insecticides and plastics and polyester are made, the oil that brings countless manufactured goods to us from overseas, the oil on which farmers depend for irrigation pujmps, for transporting produce to market, for working the soil to bring us food. If you believe the graph, it will almost all be gone in 20 years. And the progressives and Tea-Partyers must remember that the people who brought this calamity to us are not our friends but are people we trusted and they trusted, so we must work together to cope with the mess that is upon us, and "to throw the rascals out.". The author, Nicholas C. Arguimbau, is an appellate and environmental lawyer licensed in California and residing in Western Massachusetts. He may be contacted at narguimbau@earthlink.net.